CityArchRiver executive director Maggie Hales attributes the delay to the realities of construction. Meanwhile, the top official Metro said his organization is “very, very close” to finishing a long-term contract to run the Arch’s trams. Elevating Leonor K. Sullivan Blvd. out of the floodplain to help reduce flooding. Adding plantings and lightings to enhance the surroundings. Creating a separated bike lane and pedestrian walkway that will connect into Great Rivers Greenway’s system of trails, parks and greenways. Trautman said an enhanced riverfront would attract boats and barges “that bring recreational experiences that can’t be done today” because of flooding. There could be more opportunities, she said, for special events, festivals, craft fairs, food vendors and relaxation. Trautman also said the riverfront project will allow somebody to walk from downtown, through the Arch grounds and down to the river without having to use steps or an elevator. And it will also serve as a “critical connection” on the Great Rivers Greenway system. The total project will cost about $33 million, with about $23 million going into construction. In addition to funding from a Great Rivers Greenway sales tax passed in the 2000s, Trautman also said several federal transportation grants – including an $11 million TIGER grant – will go toward the project. The project will be split up into two construction phases. The first phase will include work from Chouteau Avenue to the Grand Staircase and is scheduled to be complete in fall 2014. The second phase – beginning in fall of 2014 -- will complete the work from the Grand Staircase to Biddle Street. Target date for completion is October 2015. Both Trautman and Hales emphasized that the project would not completely eliminate flooding. Trautman estimated the project would be “able to buy 60 to 70 percent more days that we would have been inundated by water. The CityArchRiver project is, of course, a public-private partnership aimed at overhauling the Gateway Arch’s grounds by Oct. 28, 2015 – the monument’s 50th birthday. In an interview on Tuesday, Hales said that most of the project will be ready by the Oct. 28, 2015, goal – including the I-70 park and renovations to Leonor K. Sullivan Boulevard. But a desire to keep the Arch up and running through construction prompted some alterations. “That was one option: Close it down. Really we thought about that and talked to Convention and Visitor Commission, the park service, Great Rivers Greenway, Metro,” Hales said. “Nobody wanted to do that." Project handlers also will postpone planting London plane trees along processional allees until spring 2016. “The spring is the best time to plant, they’re going to last longer, they’re going to do better and there’s no springtime between now and then to do it,” Hales said. While she said an overhaul of the western part of Kiener Plaza would be finished by October 2015, construction on the eastern part would begin sometime in the fall of 2015. Hales said she wanted to use that part as an orientation during the summers of 2014 and 2015. Asked if she were disappointed that the project wouldn't meet its original deadline, Hales said it would be worth it. 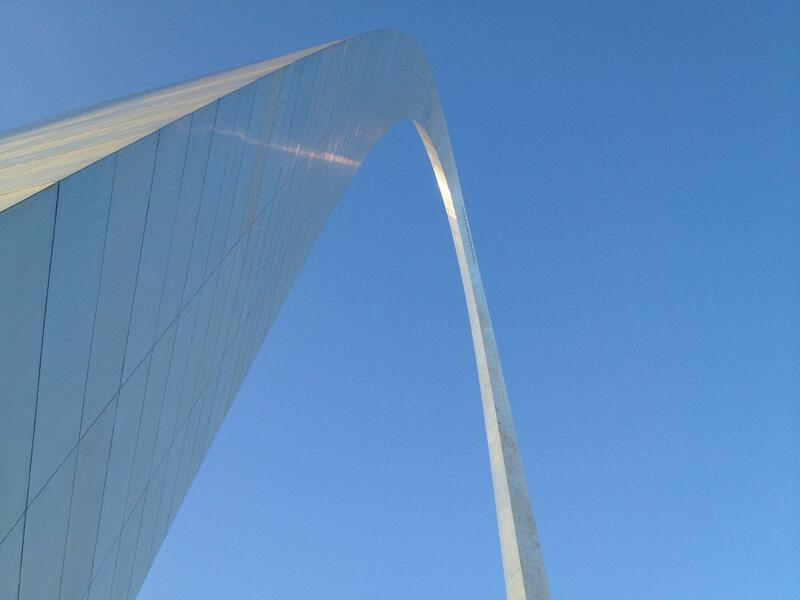 In October, St. Louis and St. Louis County started collecting proceeds from a 3/16th of one cent sales tax increase that includes funding for the Arch projects. Hales said CityArchRiver has raised over $105 million to date in private money. Handlers of the projects are angling to raise $221 million for capital costs and $29 million in endowment for a conservancy. “It’s pledged, in that it’s in hand. So it’s a legal commitment,” Hales said. Meanwhile, John Nations, the president and CEO of Metro, says he’s optimistic that the issue of the tram will soon be resolved. For decades, Metro has operated the trams that take people up to the top of the Arch. But that contract expired in 2012 and the agency has been using short-term extensions to continue the arrangement. CityArchRiver wanted a long-term contract on the trams to be finalized before it would sign off on agreements with the park service. Nations told the Beacon a long-term agreement is important since short-term extensions don’t allow Metro to enter into any bonding arrangements for longer-term projects. He emphasized that there’s no disagreement with the park service. “The park service is trying to get the agreement through their bureaucracy,” said Nations. “The NPS will tell you that the partnership with us is one of the best, if not the best partnership they have in the country,” Nations said. “Both the National Park Service and we would like to see this arrangement renewed and perpetuated long term. Frankly, it works well for all concerned. But in the last 50 years, there have been all kinds of statutes and regulations adopted that are applicable here. "The ability of the park service and Interior Department to get it done quickly based on a vastly changed regulatory environment in 2013 has proven challenging for the National Park Service,” he added. Nations said the issue has the attention of Missouri’s congressional delegation – including U.S. Sens. Roy Blunt, R-Mo., Claire McCaskill, D-Mo., and U.S. Rep. Lacy Clay, D-St. Louis.